Alumni association members should be getting our Sept./Oct. issue any day now. 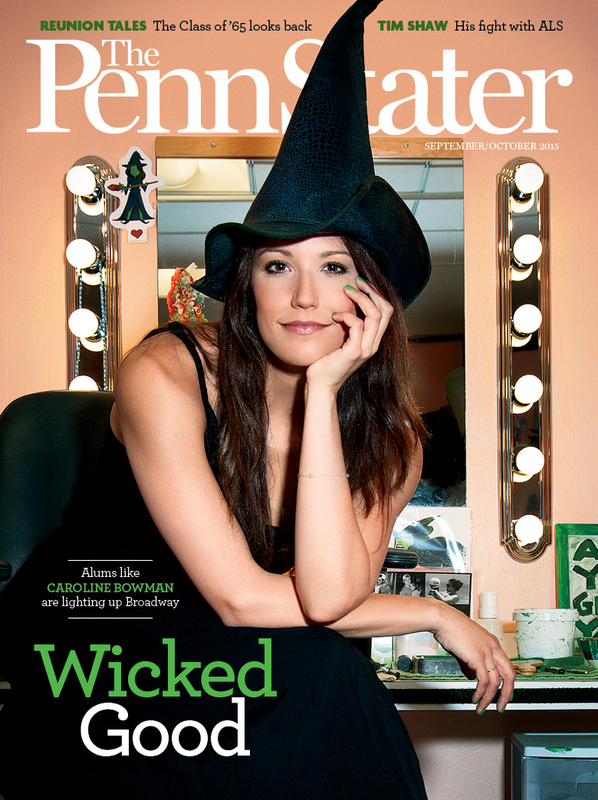 On the cover is Caroline Bowman ’10—otherwise known as Elphaba the witch in Broadway’s Wicked. Photographer Michael Lavine captured the actress in her New York dressing room before the show—and before her nightly coating of green body paint. In “The Great (Blue and) White Way,” senior editor Ryan Jones caught up with Bowman and other theater alums making names for themselves on Broadway and beyond. Also featured in this issue: Former Nittany Lion and NFL linebacker Tim Shaw ’06 opens up about his battle with ALS. More highlights: A look at the 2015 Women’s World Cup, which featured a number of Penn Staters, including two members of the all-conquering U.S. team; an interview with Jay Paterno ’91 about a new namesake beer; and a conversation with “career student” Jesse Scott ’03a, ’06, ’10g, who has been taking classes for 14 years. Let us know what you think of the Sept./Oct. issue by commenting below or emailing us at heypennstater@psu.edu. Entry filed under: From the Magazine. Tags: Caroline Bowman, Jesse Scott, September/October 2015, Tim Shaw.